Isn’t it a joy to find new children’s picture books? Today I want to share a range of books with you, and encourage you to seek them out so you can share them with the young readers in your life. You’ll find the first edition of my 2017 children’s picture book round-up in August,and the second in October. The Great Rabbit Chase is a children’s picture book written and illustrated by Freya Blackwood, published by Scholastic Press (2017.) RRP: $Au 24.99 HB. Like most rabbits, Gumboots is a skilled escapologist. More and more people join in the Gumboots recovery team as it winds its way through the town and we get to know a little about each one. At last they reach the park and suddenly everyone’s cares and frowns seem to fall away. There’s a final delightful twist, and readers are left with that from-the-boots sigh which comes at the end of every fantastic picture book. I am a huge Freya Blackwood fan. It’s lovely in The Great Rabbit Chase to read her own words and see their seamless integration with her beautiful illustrations. Mellow light seems to fill each page and her characters are captured in evocative detail. I loved that the end papers are a board game of the story that kids can play with dice. Wouldn’t that make a wonderful challenge once you’ve shared this book with kids? They could invent board games about a chase, or use found objects or paper and pencil to map the journey. Do look out for The Great Rabbit Chase, for library and home. It’s sure to become a classic, and I am awarding it the coveted Book Chook Feather of Approval. It’s a definite contender for The Book Chook’s Top Children’s Picture Books 2017. Say Zoop is a children’s picture book by Hervé Tullet, published by Allen and Unwin (2017.) RRP: $Au 22.99 HB I have previously reviewed Tullet’s Let’s Play. Here’s a new children’s picture book that invites kids to interact with it. The first page addresses young readers with a question: “Hello, would you like to play?” and away we go. We press dots and make louder noises on the bigger ones. We change noises, use robot voices, have fun, all the while surrounded by colourful dots and lines. And then these shapes sort themselves onto a background of five horizontal lines that look a lot like a musical staff. The mostly blue, red and yellow on white palette is stunning. What a wonderful way to have children think about and react to sounds, colours and shapes, and be introduced almost incidentally to the idea of recording sounds as music. I will be adding Say Zoop to my list of Hilarious Interactive Children’s Picture Books for Kids. Animals Rock and Other Wild Songs is a children’s picture book of songs from Beau Young and Shelley Craft, illustrated by Susy Boyer and published by Koala Books (Scholastic) (2017.) RRP: $Au 16.99 PB. Beau Young and Shelley Craft team up with the Animals Rock band to bring you a heap of catchy songs all about animals–straight from the jungle! Includes audio CD with all the tracks from the book. Great wildly coloured illustrations and 5 rockin’ song tracks will encourage kids to choose this children’s picture book with accompanying CD. The songs (Animals Rock, Crocodile Fishin’, A Lion’s Roar, Long Neck Giraffe and Hip Hippo) are short and catchy. You can listen to some on the Animals Rock website, and find out more about the Byron Bay-based band. Being able to read along while listening is a great way for kids to develop skills they need for reading, making Animals Rock a great choice for car, for home or for the classroom. Pig the Star is a children’s picture book, written and illustrated by Aaron Blabey, and published by Scholastic Australia (2017.) RRP: $Au 16.99 HB. One of the many things I appreciate about Blabey’s books is his attention to detail. The front endpaper has a photo shoot call sheet with Star 1: Pig (Pug). Star 2 is Trevor (Dachshund) but someone has apparently taken a red felt pen, crossed out Trevor’s name and scrawled “Pig, Pig, Pig, Pig”. I wonder who did that? Even before they start the actual story, kids will be grinning. Inside we find Pig up to his old trick of hogging the limelight, and oh, Blabey has outdone himself with the costumes the dogs put on! (My favourite is Pig as Mona Lisa, but Tarzan comes a close second.) Needless to say the whole story is in rollicking rhythm and rhyme, perfect for sharing with kids as a read-aloud, or for young readers who want a laugh. Another great Pig book to add to your collection. I Wish I Could Be a Superhero is a children’s picture book written by Susan Hall, illustrated by Cheryl Westenberg, and published by National Library of Australia (2017.) RRP: $Au 17.99 PB. I don’t know any child who hasn’t longed to be a superhero. Sadly, it seems as if Wesley has nothing special about him at all, unlike his amazing friends. In I Wish I Could Be a Superhero, Hall has chosen a theme children will relate to, and gifted us with lots of hilarious situations as Wesley tries to emulate his friends. There’s an underlying message of self-acceptance, and a feel-good ending, followed by a a final section describing the real ‘superpowers’ of the animals in the book. Flaps are on many pages and really introduce a lovely tension to the read-aloud experience. For example: Wesley kits himself up to swim underwater in snorkel, mask and a huge inflatable swim ring. The closed flap tells us “But when he tried…” so kids just know something is going to go wrong. Sure enough, when we open the flap, there is Wesley upside down underwater, gargling “Help!” Children will love the way the different scenarios are repeated in the same format, allowing them to build anticipation and predict what might happen next. Westenberg’s bush characters are priceless, especially Wesley, a rotund wombat in slightly too small superhero outfit. I Want to Be in a Scary Story is a children’s picture book written by Sean Taylor, illustrated by Jean Jullien, published by Walker Books (2017.) RRP: $Au24.99 I have previously reviewed Hoot Owl, Master of Disguise by Taylor and Jullien and it is on my list of Top Children’s Picture Books 2015. Monster wants to be in a scary story – but is he brave enough? Scary stories have creepy witches and creaky stairs and dark hallways and spooky shadows… Oh my goodness me! That is very scary. Maybe, a funny story would be better after all? Brilliantly interactive, children will delight in the wickedly funny turn-of-the-pages, see themselves in the goofy, unconventional monster, and revel in the bold, hilarious illustration of celebrated graphic artist, Jean Jullien. Taylor and Jullien work so well together, seamlessly weaving a very funny tale of a little monster who reminds me of many kids I know. They “think” they like scary, but sometimes “scary” overwhelms them with terror. Taylor’s words reveal little monster’s youth, his enthusiasm, then his growing doubts as his plans backfire. Jullien’s graphic art uses bold yellows and purples in some plain background pages, and contrasts these with pages that show more detailed dark backgrounds of the spooky house and scary forest. It’s tremendous fun to read aloud, and will also be a book that kids will want to read for themselves, over and over. I Want to Be in a Scary Story lends itself to being read aloud in two voices, one the enthusiastic little monster in his own large purple font, and the second the calm voice of the narrator, keen to put little monster into scary situations. The story thus unfolds as dialogue, with Taylor and Jullien guiding the read-alouder with text, font, punctuation and illustrations. I can certainly see the book being a great vehicle for reader’s theatre, and it will appeal to a wide age range as a read-aloud. Students could also compare it with a picture book like Narelle Oliver’s I Want to Be in a Book. I’ll be adding I Want to Be in a Scary Story to my list of Hilarious Interactive Picture Books for Kids. Goodnight Everyone is a children’s picture book, written and illustrated by Chris Haughton, and published by Walker Books (2017.) RRP: $Au 16.99 PB. I have previously reviewed Haughton’s books Shh! We Have a Plan, Oh No, George! A Bit Lost, and his app, Hat Monkey. In this stunningly illustrated bedtime book, perfect for the end of the day, a series of exquisitely coloured cut pages of increasing size introduce woodland families – bears, deer, rabbits and teeny, tiny mice – who are all beginning to feel really ... rather ... tired ... YAWN! "Dear me," says Great Big Bear, "it must be time for bed!" But Little Bear is certainly not sleepy – he's wide awake! (For now...) With sublime, starry night time scenes and an infectious yawny "Good night" refrain, Chris Haughton creates a lulling bedtime read, perfect for parents and children to share together. Open this book and you fall immediately fall into a most exquisitely coloured landscape. Vibrant purple, fluoro pink, lime green, acid yellow with splashes of orange and turquoise, and tiny hints of black and white reveal sunset in the woods, with little creatures’ eyes growing sleepy. We not only meet various woodland creatures getting ready to sleep, but we join in with their yawning and stretching, a wonderful idea for settling readers and listeners down. But wait! We meet Little Bear, and he really doesn’t seem ready to sleep. Kids will nod in recognition, and probably giggle softly as finally even Little Bear succumbs to all these sleepifying noises and the gentle “goodnight” refrain. Anyone still awake will enjoy the end papers with their depiction of the stars in both the southern and northern night skies. Goodnight Everyone makes a lovely bedtime story and is a must for homes and libraries wanting quality picture books. Check out the trailer for more insights into the book. 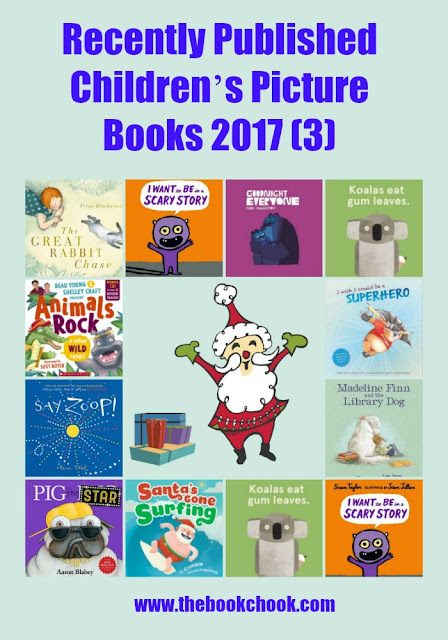 Santa’s Gone Surfing is a children’s picture book written by P. Crumble, illustrated by Thomas Fitzpatrick and published by Koala Books, an imprint of Scholastic (2017.) RRP: $Au 16.99 HB. But this year, Santa decides it’s too hot to deliver presents. He grabs a surfboard and heads out to catch some waves... Can Trev, his old ute and a flock of emus save Christmas Day? If you’re looking for a new Chrismassy and Australian themed picture book, check out this one. Santa is fed up when he gets to Australia in his hot and itchy suit, so he decides to go surfing instead. Emergency! Who you gonna call? Well, in this case, Trev, the emergency Santa. Poor Trev hasn’t even passed Santa school yet, but he grabs his ute and emus and gives it a shot. There are references to Australian towns, slapstick humour kids will appreciate, and the narrative unfurls in rhyming couplets. Fitzpatrick’s cartoon-style illustrations add lots of colour and fun. I especially enjoyed the fierce look on Squinty, the emu with a glowing red eye! Koalas Eat Gum Leaves is a children’s picture book by Laura and Philip Bunting, published by Omnibus Books (2017.) RRP: $Au $16.99 HB. I have previously reviewed Bunting’s Mopoke and Koalas Eat Gum Leaves is a contender for The Book Chook's Top Children's Picture Books 2017. Koalas eat gum leaves. Nothing but gum leaves. For breakfast, lunch and dinner, and even on their birthdays. But one koala discovers something a lot more tempting. This koala eats nothing but ice cream. Ever heard of too much of a good thing? The incredibly cute koala on the front cover delights and intrigues immediately. What is he half-hiding behind his back? The endpapers feature koalas too - some conventionally munching gum leaves, but one clearly eating something else. Inside we discover that though most koalas endlessly eat gum leaves, there is one who wants something tastier. He searches for more and through his binoculars we see a snail - No, gum leaves - No!, a snake - Woah. and then an ice-cream - Hello! Such clever use of minimal rhyming text has us chortling and the accompanying graphic design milks every ounce of humour from each situation. Kids will understand Koala’s obsession with the sweet treat, nod ruefully over what looks like a marsupial tummy-ache, and recognise that in anyone’s life, there can be too much of a good thing. As in Mopoke, Koalas Eat Gum Leaves uses sparse text, with an emphasis on visual communication. Children will love Bunting’s art work and I know they will be keen to create koalas from simple shapes in shades of grey with touches of black and white. This could be achieved in an art lesson, with construction paper, or using digital design with an app like Assembly or Google Drawings. The book is a worthy addition to fiction resources about Australian animals, and would be great paired with an information text like Koala by Claire Saxby and Julie Vivas for some research into real life koalas. Madeline Finn and the Library Dog is a children’s picture book by Lisa Papp, published by Old Barn Books (Walker Books in Australia) (2017.) RRP: $24.99 HB. A beautiful, reassuring, story for all those struggling to read. Madeline Finn does not like to read. Not books. Not magazines. Not even the menu on the ice cream van. Fortunately, Madeline meets Bonnie, a library dog. Reading aloud to Bonnie isn’t so bad. When Madeline Finn gets stuck, Bonnie doesn’t mind. As it turns out, it’s fun to read when you’re not afraid of making mistakes. Bonnie teaches Madeline Finn that it’s okay to go slow, to keep trying, and to get support from a friend. When I was a child, I had no idea that there were people who struggled to read. I know it now, and it is so unfair! How can reading be the wonderful pleasure I know if it doesn’t come easily like breathing? Madeline HATES to read. She says the sentences get stuck in her mouth like peanut butter. She gets stickers that say “Keep Trying” when all she wants is the star. Children know in their hearts the difference between first place and an encouragement award! Papp’s illustrations are full of detail and emotion. They work seamlessly with the text to show us what it’s like to be Madeline, and how the first tendrils of optimism unfurl when she meets Bonnie the Reading Dog. I KNOW there are kids who will understand Madeline and her problem. Maybe this book will be the one that will make them feel less alone and misunderstood. I believe Madeline Finn and the Library Dog should be in every library and hope that teachers will share it with any student who needs to hear its reassuring message. If you're looking for books to give as Christmas gifts, all of the above would make fine choices. On December 6 I'll publish a long and carefully chosen list of even more wonderful book gifts for you. Find still more Children's Book Reviews on The Book Chook by clicking Reviews in the right sidebar.